UN Assistant Secretary-General, Ms. Bintou Keita, on her first official visit to Haiti. © Leonora Baumann / UN / MINUJUSTH, 2018. 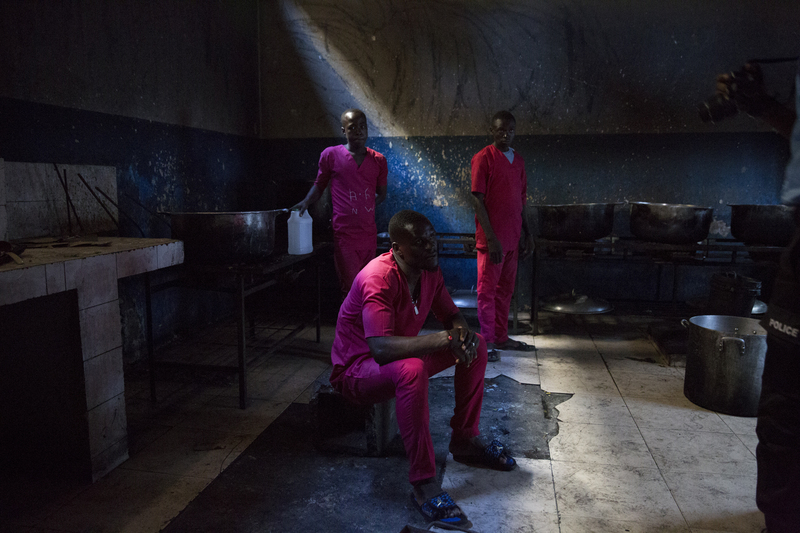 For Ms. Keita, prison conditions are « unbereable » not only for inmates, but also for those who work in the facilities. © Leonora Baumann / UN / MINUJUSTH, 2018. The United Nations Assistant Secretary-General for Peacekeeping Operations, Ms. Bintou Keita, visited Haiti from 5-9 February, her first official mission to the country. During her visit, Ms. Keita stressed the importance of a close partnership between the UN and Haitian institutions, as well as strengthened rule of law and human rights in the country. A new peacekeeping mission created by the Security Council in October 2017 will be in Haiti for a short period of time. From now until spring 2020, MINUJUSTH, the United Nations Mission for Justice Support in Haiti, will back the professionalization of the Haiti’s National Police and strengthen the rule of law, including Justice institutions and correctional services, to ensure human rights promotion and protection, as well as gender equality and equity in the country. Upon her arrival to Port-au-Prince, the Assistant Secretary-General met with national counterparts to identify key milestones to strengthen the rule of law in the country, central to MINUJUSTH transition until its conclusion in 2020. While in the country, Ms. Keita held meetings with major stakeholders. On 6 February, Ms. Bintou Keita was received at the National Palace, where she met with President Jovenel Moïse and Prime Minister Jack Guy Lafontant, respectively Haiti’s Head of State and Head of Government, who reaffirmed their engagement to benefit from the window of opportunity created by the two-year mandate of MINUJUSTH, and advance the rule of law in the country. Judicial chain failures can harm stability and sustainable development in Haiti. Together, they discussed issues such as corruption, impunity and prison overcrowding, as well as the lack of access to justice by the most vulnerable in the population. Judicial chain dysfunctions can have a serious impact on human rights, and could jeopardize stability and the transition towards sustainable development in Haiti. During her visit, Ms. Keita also discussed these issues with Members of Parliament and representatives from several Haitian institutions, including the Judiciary Supreme Council, First Instance Courts of Port-au-Prince and Jeremie, the Correctional Facilities Administration, the National Police and the Office for Citizen Protection, as well as many civil society organizations working in the area of human rights. In her meetings, the UN Assistant Secretary-General noticed a consensus about the need for profound changes in the area of Justice in Haiti, including the need to reinforce monitoring and control for more accountability, but also to de-politicize the Judiciary to ensure its independence. In face of the situation of Haitian prisons, Ms. Keita insisted on the urgency of promoting a transition towards the rule of law in the country. During her stay in Jeremie, Ms. Keita visited the local prison to see for herself the conditions faced by the 304 inmates—including men, women and children—incarcerated in cells that could technically hold only 100 prisoners in total (the standard in Haiti is 2.5 m2 per prisoner). This superpopulation was described as « unbereable » by the Assistant Secretary-General at a press conference held at Port-au-Prince on 9 February. Only 51 out of the 304 Jeremie inmates have been tried in a court of law. Only 51 out of the 304 Jeremie inmates have been tried in a court of law. The remaining 253 (83%) are still in pre-trial detention, not having had a chance to see a judge. For many years, this has been a recurring violation of rights, common in other correctional facilities in the country. Yet, the UN Assistant Secretary-General was optimistic about the intentions expressed by national authorities, to face the challenge and implement Sustainable Development Goal 16, on the importance of effective institutions to provide access to justice for all. Ms. Keita highlighted the responsibility of all actors, individually and collectively, to articulate this vision and identify the interventions needed to strengthen the rule of law in Haiti. Ms. Keita ended her visit by reminding partners about the importance of Haitian authorities, institutions and civil society organizations’ autonomy and responsibility. MINUJUSTH and the UN Country Team will support their initiatives in this area from now until 2020.